As I mentioned in the first Work Beyond Mac column, my go-to iPad keyboard for the last few years has been Logitech’s Ultrathin Keyboard Cover. It’s lightweight, portable, has a battery that lasts forever, doubles as a screen cover when traveling, and has an adjustable viewing angle. Despite having a preferred keyboard, I’m still eager to try new products as part of my never-ending hunt to refine and perfect the way I work on an iPad. 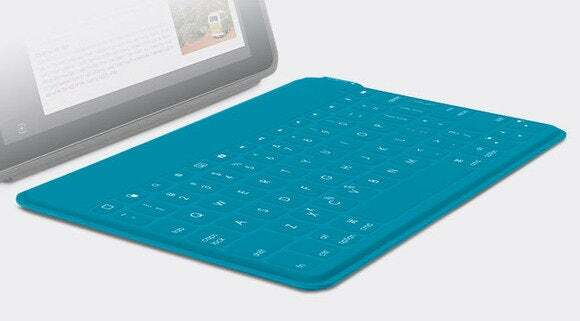 So when Logitech announced a new Bluetooth keyboard for iOS devices, Keys-To-Go, it naturally piqued my curiosity. 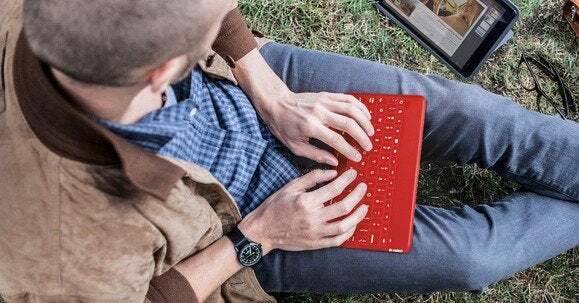 The $69 keyboard is compact, covered in a spill-resistant fabric, boasts three months battery life, and most intriguingly lacks any method for connecting itself to your iPad. Up until this point, I had only ever used a keyboard that doubled as a stand, or completely enclosed my iPad in a folio-type housing, but I appreciate how Keys-To-Go lets me use any case I want—or no case at all. As with the rest of Logitech’s lineup, the top row of the Keys-To-Go keyboard offers shortcut keys for common iOS tasks. With the press of a button you can return to the home screen, open Spotlight, launch Siri, activate the fast app-switching view, take a screenshot, control media playback, and adjust your iPad’s volume. In the top-right corner of the keyboard is a button with a battery icon on it. Pressing it causes the small LED to light up, indicating the current level of the keyboard’s battery. I appreciate the ability to quickly identify if the keyboard needs to be charged, especially if I’m about to head to a coffee shop or on a business trip. But I desperately miss the lock key, which is normally located in the same spot on other Logitech keyboards. I’m constantly locking my iPad when I walk away from my desk, and I enjoyed having a keyboard shortcut to accomplish this. Granted, reaching up and pressing the Sleep button on my iPad takes minimal effort on my part. It’s retraining my brain to quit reaching for the key and expecting the same result that’s challenging. I was able to regularly transition from my MacBook Air’s keyboard to the Keys-To-Go without any major learning curve. The keyboard’s overall footprint measures at just over 9 by 5 inches and 6mm tall. What does that mean to you? The outer keys such as Shift, Delete, and Return have seen the biggest reduction in overall size, with the rest of the keys remaining nearly full-size. Whether you work alone in a home office, or in a large office full of coworkers you’ve undoubtedly been annoyed by the clickity-clack of a keyboard or two. Keys-To-Go, however, makes almost no noise when someone is pounding away at the keys. I’m not sure if it’s due to the material used to cover the keyboard, or the way the keys are engineered underneath it, but this thing is astonishingly quiet. No matter how hard I would press a key, I was only ever able to elicit a subdued “click” from the keyboard. At one point my 4-year-old walked over to my desk and asked if I was pretending like I was working, because he couldn’t hear anything. Not only was it an adorable question, it just goes to show how loud other keyboards are in comparison. So far so good with the Keys-To-Go keyboard—but there is one problem that’s likely to drive you as crazy as it did me. 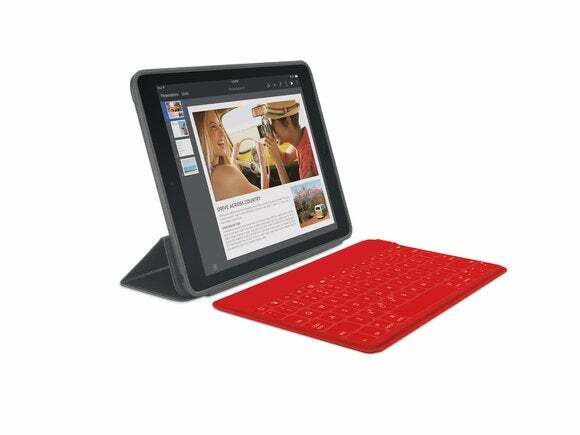 When using the keyboard on a smooth surface, such as a finished wood desk or table, the keyboard moves. (I don’t have a glass table, but I imagine the problem would be present there as well.) It wiggles just enough to throw off your typing, forcing you to stop and adjust the keyboard or move your hands to the correct keys. It’s an ever-so-slight movement, but one that over time becomes increasingly annoying. When resting the keyboard on my lap, or an unfinished surface, the problem vanished. I would love to see small feet added to the corners to eliminate the issue—I just might end up picking up some stick-on feet from Amazon. For users of either size iPad or even an iPhone 6 Plus, the Keys-To-Go is a solid choice. Not only does it ditch the requirement to replace (or remove) the case on your device, it’s lightweight, super portable, quiet, and offers a familiar typing experience. The wiggling issue I experienced on a slick surface can be easily remedied with a little ingenuity, but still, it should have been a nonissue. I haven’t decided yet if it’s going to replace my tried-and-true Ultrathin keyboard, but I can tell you it’s giving that one a significant run for my money. Keys-to-Go is literally the keyboard that doesn't want to stay put, but it's also quiet, convenient, and just as easy to type on as Logitech's Ultrathin Keyboard Cover. You can use any case. Slides around on smooth work surfaces.